Nathan James, Author and Activist: Living Room Sessions III Tonight at Red Bamboo! Tonight, Rebel Starr presents Living Room Sessions III at Brooklyn's Red Bamboo Restaurant. This latest in the popular poetry/spoken word series is the first time it's been held outside Manhattan. What makes the Living Room Sessions particularly unique is its engage-the-artists format. After each artist has performed his or her work, the audience is encouraged to open a dialogue with them about the work. It's a fascinating way to discover people's individual impressions about the art presented. 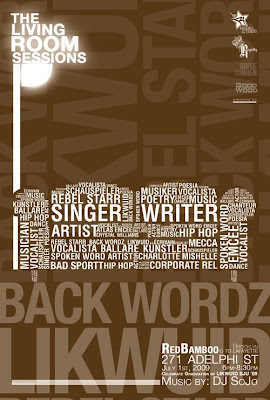 Hosted by Likwuid (Queen Of The Queendom), and Back Wordz, the past two Sessions were a huge success. It is amazing to be amongst so many creative people, and partake of the wonderful artistic energy that such a special event generates. I'll be reading new original poetry alongside some truly gifted artists and writers from all over the city. Immediately following the session, there will be a Reel Soul presentation of the classic Diana Ross film, Mahogany, also at the Red Bamboo. So there you have it, poetry, spoken-word, good food and company, and classic cinema to top it all off! The Red Bamboo is located at 271 Adelphi Street in Brooklyn, near DeKalb Avenue. Take the C train to Lafayette Avenue, or the G to Clinton-Washington Aves. Living Room Sessions III begins at 6 PM.